Did you know…? By 2050 there will be more plastic in the sea than fish! We are all responsible for this startling statistic and this was the reason why Ega worldwide congresses & events decided to take the plastic pledge launched by IAPCO – the International Association of Professional Congress Organisers. 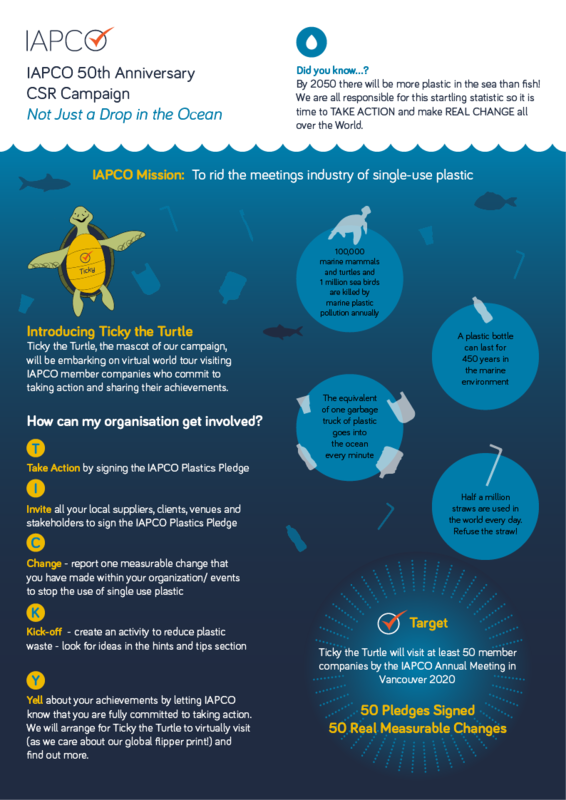 Together with Ticky the Turtle, the mascot introduced by IAPCO to represent the campaign against the use of single-use plastic in our meetings industry, we have decided to take the first steps in our offices in Rome, Milan and Basel and to implement further changes at our congresses, events and meetings. In our offices we will eliminate all single-use plastic to drink our thousands of coffees during the year and have installed a water gallon. At the events organised by us we will stop using plastic name badges and reinforce the activities already implemented to further reduce waste. We are sure that our actual and future clients will appreciate that we support the IAPCO mission to rid the meetings industry of single-use plastic.